Radiant in her white satin wedding gown, Patricia Blakely was living a dream come true. At last, she was marrying the man she loved, Ted Kimble—a fellow Christian and son of a local preacher. But little did she realize her new husband had a dark side. Soon her dream would come to a tragic end. Shock waves rocked the small, North Carolina town of Pleasant Garden when Patricia’s charred body was discovered inside the Kimble’s burned-out home. And soon family and friends learned an even worse truth—Patricia had died from a bullet wound to the head. 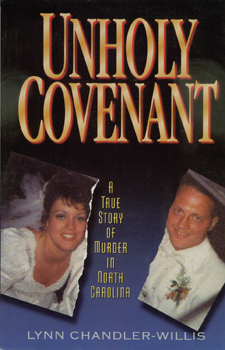 Now, in Unholy Covenant, North Carolina journalist Lynn Chandler-Willis uncovers the story behind the crime. Taking readers from the crime scene to the courtroom, she delivers a passionate account of a story that forever changed the small North Carolina community.